We are currently undertaking a project for the Province of Tarlac that looks into the safety along its rural roads (both national and provincial roads) including those providing access to tourism areas in the province. Along many rural roads are agricultural lands producing rice, corn, fruits, vegetables and other products. Often, travellers will encounter roads that serve another purpose other than transport – as solar dryers. Before rice is milled, it needs to be dried first so that it would be easier to remove the husk (i.e., separate the bigas from the ipa – together they are called palay). While it is possible to do this drying on mats (banig) spread over the land/soil this takes time. Meanwhile, portland cement concrete roads offer what seems to be the perfect surface for drying. As such, certain roads have been known to get justification for concreting despite low traffic volumes as they double as solar dryers. There are similar cases for basketball courts or village plazas receiving funding for concreting for the same reasons. Obviously, laying out rice on the roads have implications on the quality of the rice later on as vehicles will inevitably (even inadvertently) pass through the roads. I guess its even worse in cases when the road surface is of asphalt concrete. Following are photos I took along rural roads in Bamban, Capas and San Jose towns of Tarlac. Other items that are usually dried on the roads include tingting (the stems of coconut leaves that are used to make brooms – walis tingting) barbecue and fish ball sticks. 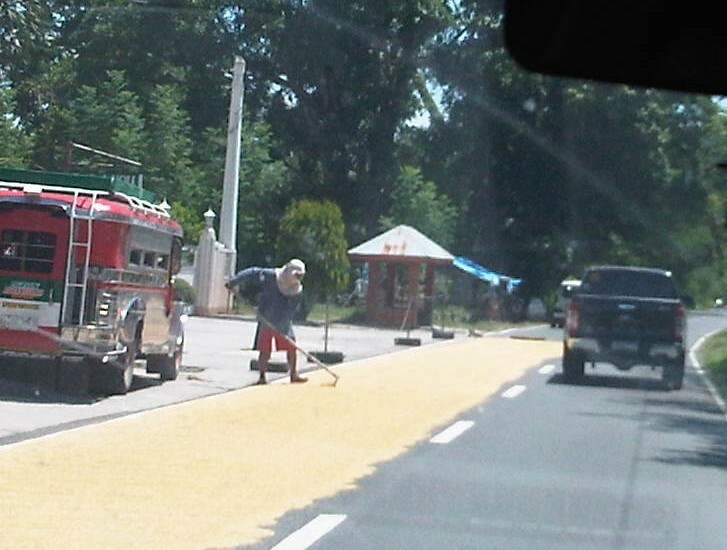 I have also seen fish being dried on the road one time during a trip to Northern Luzon. Obviously, among the risks are the rice being grinded by the tires of vehicles (resulting in durog na bigas more suitable for porridge), fuel or oil compromising the rice, and the prospects of animals doing their thing on the road near or on the rice! More on these solar dryers in the next post!